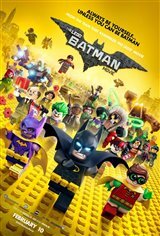 LEGO Batman (Will Arnett) lives a lonely life in his Batcave along with his butler Alfred (Ralph Fiennes). He misses his family, but won't admit it. When saving the city from The Joker (Zach Galifianakis), Batman tells The Joker that he means nothing to him. Upset that he is not Batman's greatest enemy, The Joker flees in search of a plan to prove to Batman how wrong he is. In the meantime, Gotham City Police Commissioner James Gordon hands the keys of the city to his daughter Barbara (Rosario Dawson), who later becomes Batgirl. While distracted by Barbara's beauty, Batman accepts young orphan Robin's (Michael Cera) plea to be adopted. Soon, big changes take place in Gotham as The Joker joins forces with other evil masterminds to destroy the city. Batman is forced to drop the lone vigilante thing and work with Batgirl, Robin and Alfred to save Gotham.